Let me say that, in the main, I’m not a fan of Consultation confidentiality. It’s an extremely harmful aspect that severely reduces the quality of responses. Saying this up front, you can continue to read, knowing this position, or go somewhere else (I won’t hold it against you). 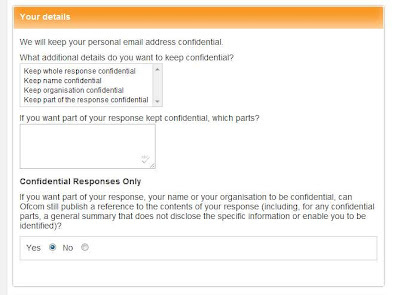 Individual respondents are regular, every day people, who are submitting to a consultation on their own behalf. They are participating in government, and should be applauded. And their name and contact details should be protected by default to encourage participation. Indeed, the BIS did this in the past, which is one reason I now submit all my consultation responses as a company, Norton P2P Consulting. Companies, on the other hand, generally don’t submit to consultations unless their business is related to the consultation topic. Thus, instead of a personal viewpoint, it’s a viewpoint of a business, where there is a pre-existing determination on the topic, and as such the name of the company is in the public interest, so that the submission can be evaluated in context. As a company, their contact details should generally be available anyway, so there’s no need to redact it. So, what about the content? Here there’s no clear case at all for any sort of confidentiality. 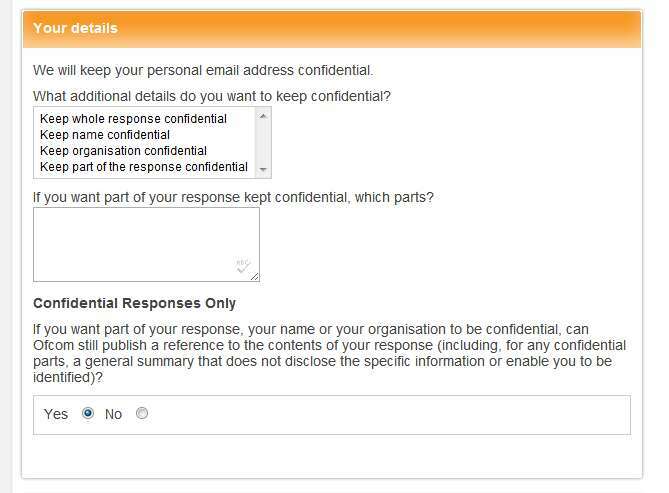 There is a strong case against confidentiality being applied at all, as it’s not in the public interest at all. In fact, a lot of the information removed for confidentiality is done so on the grounds of commercially sensitive information or trade secrets. The problem is, then, that policy is not being made on the basis of open and equal information, but on the basis of companies trade secrets. Company A can make all kinds of claims of what it can do, and what it would like to do, and hide it in a confidentiality requirement as it’s a ‘trade secret’. So we end up with policy that looks strange and doesn't make sense from the perspective of an outside observer, because there’s hidden ‘evidence’ that can’t be checked, but which is influencing the results. Keep your secret a secret, and deal with things and adapt if the results of the consultation don’t go your way. Include it in your consultation for consideration, and have it no longer be a trade secret, or confidential information. The simple fact is that consultation and government policy is not there to make preferential rules for private businesses and their trade secrets. It’s a decision and a gamble companies have to make, and it’s long past time they stopped having it both ways. Either keep the secret and hope things turn out your way, or use the information to influence policy, and have the information under the same scrutiny as every other bit of submitted information. And that’s the key factor when it comes to this, scrutiny and peer review. The information I have no problem with being kept confidential is that of the submitter’s identity. If need be, the agency can verify that. However, the DATA of the consultation needs to be public at all times. It’s the only way to peer-review data. It’s the only way to check that data makes sense. 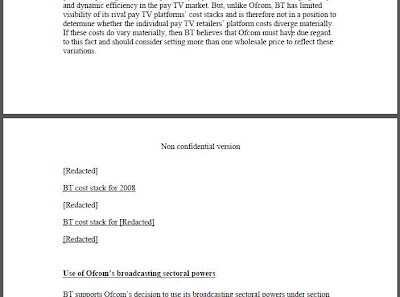 Take this example from a consultation into Pay TV run by OFCOM at the end of 2008. 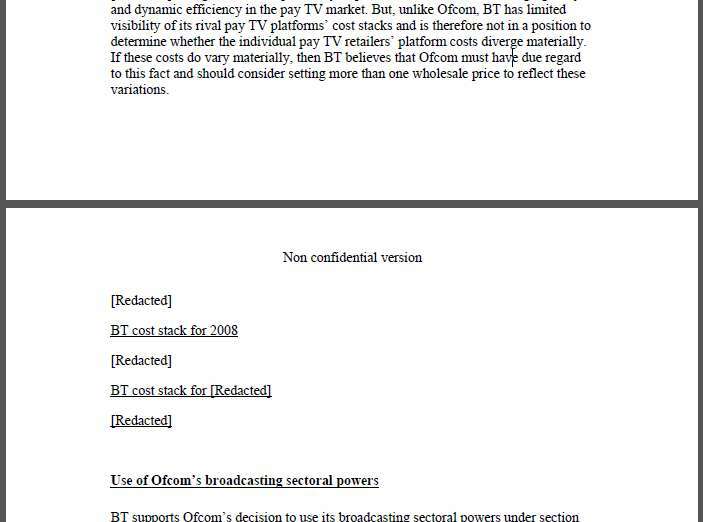 The response by British Telecom (PDF) has certain figures redacted. It does make it hard to understand what point is being made, and thus understand the impact of the cost stack, and the trend in the price. Yes, even the year of the confidential price is secret! Yes, the entire section where they answer the questions put force has been redacted. How is this good for public confidence in OFCOM that they are going to be honest and produce a result that is in the public interest, rather than in the interests of one or two companies? It’s clear that public trust in government is at an all-time low, and there definitely needs to be something done about it. Perhaps the first thing would be to stop allowing information submitted to a public consultation to remain confidential. Corporate Secrecy has no place in public consultations. And that’s why I’ll always publish my own responses soon after I submit them, un-redacted and containing every bit of information I submit, because even if agencies want to try and cover things up, my information will be available to all. As a final note, When dealing with the Intellectual Property Office over the redactions they made, I did ask if they had a process where people could point out factually inaccurate data. It seems they don’t, nor do I know of any other group that has a corrections/peer review process. The nearest most seem to come is if it becomes a big deal in the news media, where they *might* take action. So until THAT gets fixed, it seems the message is lie, lie big, and claim it as a confidential trade secret, so that people aren’t aware of it, and hope you convinced the few at the consultation office enough to buy your lies. Then again, we all knew this already, that’s how the Digital Economy Act made it past the consultation stage….